Let’s have a look at the hens. I mean, let’s have a proper look at them. They are such a mixture of the commonplace and the bizarre… They are homely, tame creatures and their appearance is the stuff of tea cosies and kitchen wallpaper but, once you get past this, you are confronted with something truly weird. When you look at them closely, you see, as Ryan says, the dinosaur in them. He points towards Quetzalcoatl and it is true: her head is raised with reptilian pride, her round eyes and sharp pupils seem as ancient as the world, they shine with the mystery and the detachment of prehistory. We know that evolutionarily the hens are not so distant from dinosaurs. Embryologists tell us that, during their development inside the eggs, chicks actually start growing a tail, like that of dinosaurs, although the process soon comes to a halt and their stumpy tail regresses. So they are dinosaurs, walking in the back garden on their hind limbs with saurian gait, spreading their three front digits on the ground, with regal clumsiness. That is the other thing about them: they could be queens or they could be paupers or peasants, the gleaners from a painting by Millet. In truth, they are not donned with crowns or head-dresses but they have combs, an anatomical adaptation that helps them to maintain their body temperature and gives an indication of their physiological status and health. Elsa’s has grown recently and has turned a deep red, a sign that she might soon start laying eggs. They also have wattles, a soft, fleshy flap of skin under their chins. Their beaks are magnificent. They are hard and strong, and their two halves are joined in a flexible, downturned corner which gives them an expression of being always a bit angry. It amazes me how long their beaks are and how they are curved on their tip, a bit like those of raptors, perhaps because I grew up seeing hens whose beaks had been mutilated up to a third of their length. These poor hens were condemned to bear a puzzled expression, like grannies that have lost their false teeth. Sadly, beak trimming is a widespread practice in intensive farming, a cruel method to avoid that hens confined in small cages peck each other to death. The ban on battery cages has come into force in January 2012. Intensive production will still continue but people are already choosing to buy eggs from kinder farms, while many others are opting for bringing the dinosaurs into their back garden, for their never ending joy. Estamos embelesados con las gallinas. Y no somos los únicos. Cuando voy a echarles un vistazo, descubro a mis vecinos estirando el cuello por encima de la valla como pájaros curiosos. “Estamos contemplando a las gallinas”, dice Dave. Su mujer, que rara vez sale de casa, está a su lado y parece divertirse. “Sí”, les digo, “es adictivo. Ya es la tercera vez que salgo a verlas y todavía no son las diez de la mañana”. Las gallinas –todo sea dicho- no nos prestan ninguna atención. Van a lo suyo, como si estuviesen demasiado ocupadas para perder el tiempo. Escarban y picotean, y devoran briznas de hierba, semillas, insectos y lombrices. Es un gusto verlas comer. Parece increíble que en los pocos metros de barrizal haya nada comestible, pero a juzgar por su frenética actividad la tierra parece abundar en delicias. En parte nuestra satisfacción se debe al hecho de descubrir que las gallinas son a la vez glotonas y gastrónomas. Se ponen moradas con todo lo que pillan pero, a la vez, hay ciertos manjares que parecen producirles un especial deleite. Cuando Betty encuentra uno de esos bocados exquisitos, echa a correr con él en el pico, mientras las otras la siguen en un frenesí de aleteos y cacareos excitados. Mike, el vecino de arriba, también viene a ver las gallinas y nos cuenta historias de cuando los vecinos del pueblo solía tener gallinas en sus jardines traseros. “La gente, por aquel entonces”, dice, “era más autosuficiente y sabía hacer cosas”. Me pregunto, si será eso por lo que nos tienen tan cautivados las gallinas, por la destreza de sus instintos y su sentido de propósito. Sea por lo que sea, ahí estamos, absortos. Y hasta Mike, que es un tipo tímido, se queda un buen rato con nosotros, charlando sobre aves y lo que se cuadre, sin despegar los ojos de ellas. En los días siguientes, más vecinos y amigos visitan el gallinero. No me esperaba algo así. Jamás hubiese pensado que las gallinas iban a crear tanto interés y que nos congregaríamos a su alredor, como alrededor de un fuego plumífero y cálido. We are in awe of the hens and we are not the only ones. People flock around them. In the morning, I go to check in on them and I find our next door neighbours leaning over the fence, stretching their necks forward like curious birds. “We’re chicken-watching”, says Dave. His wife is with him. 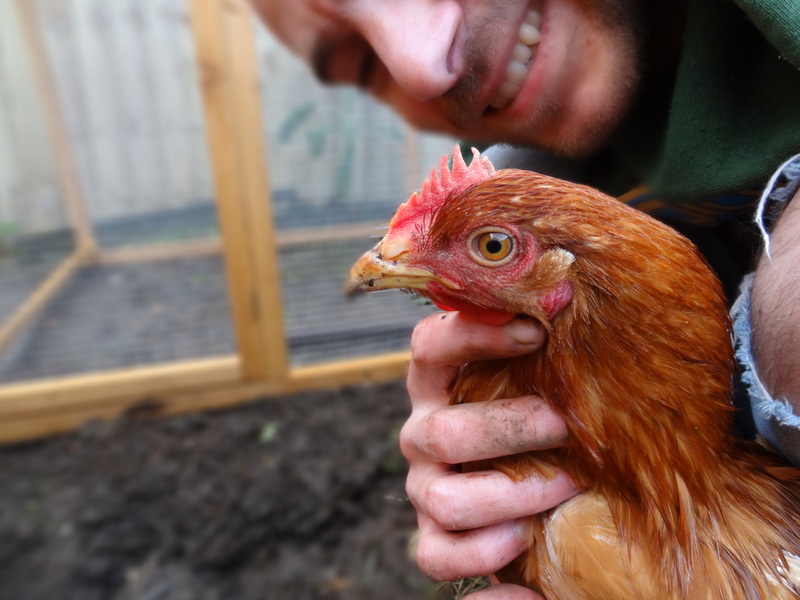 She very rarely leaves the house, but there she is, smiling, letting herself being amused by the hens. “Yeah”, I say, “it’s kind of addictive. I’ve been out here three times already and it’s not even ten o’clock”. Dave nods gravely, “Yep. I could just watch them all day”. The hens –it has to be said- are oblivious to us. They are far too busy. They go around the garden business-like, as if they have no time to waste. They scratch and peck restlessly, gobbling down blades of grass and seeds and roots and bugs and worms. For the observers, it’s immensely satisfying to watch the hens eat. It is hard to believe that there is much that is edible in the few square meters of soggy soil, but judging by their behaviour the earth seems full of hidden riches. Part of our satisfaction comes from the discovery that the hens are at the same time gluttons and gourmets. They stuff their faces but, at the same time, certain morsels seem to give them particular pleasure. When Betty finds one she runs away from the others, who follow her in a flurry of excited flapping and clucking. Mike, our neighbour from upstairs, also comes to see them. He tells us stories about the time when people in the village used to keep hens and share their eggs. He says people used to be more self-sufficient, back in the days. And I wonder if that’s what we also admire in the hens, their ability to fend for themselves. Mike is a shy guy but he seems happy to have found an inextinguishable conversation topic and so we chat for hours about people and hens. Other neighbours and friends come to meet the feathered creatures in the days to follow. It is an unexpected side effect to the arrival of the hens. We could never have anticipated that they would bring people out of their houses and that we would all congregate by their plumed and perky selves, as if in front of a cosy fire. The hens have names, of course. It is one of the first things we all do when we get an animal. It could be said that by naming them we make them ours, they become our property. With a name we project ideas and expectations upon them, we emphasise certain characteristics. Being less cynical, I would say that by naming them we grant them an individuality that they will fill with their anecdotes and life history, with their personality. By giving them a name we build a bridge towards those strangers, as a clumsy and very human way of setting the foundations for a relationship. And that bridge is a rudimentary bridge of affection. So strong is our dependence on words, it would seem that we need them in order to love. Maybe that is why we invent secret names for our lovers, to create an exclusive intimacy. 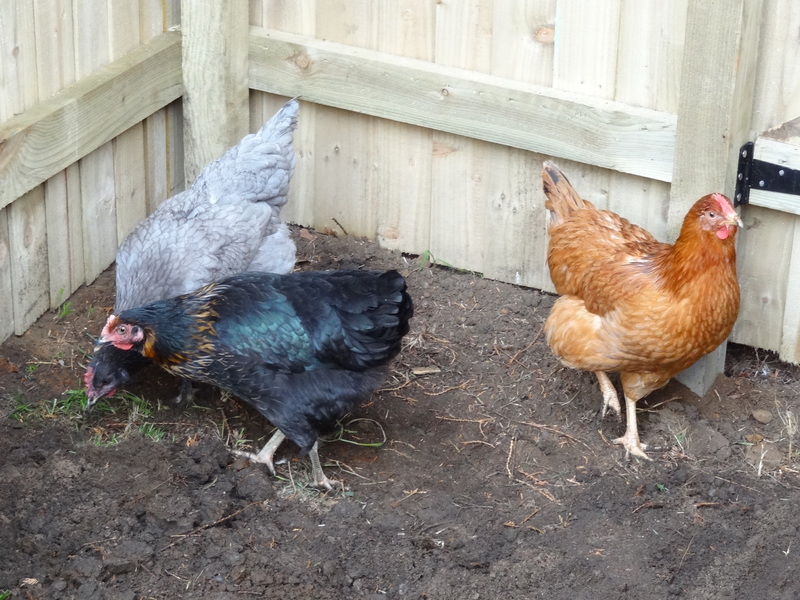 The hens are called Betty, Elsa and Quetzalcoatl. They couldn’t care less about their names. They don’t need words to relate to others, whatever species they might be. The hens have their own ways of making sense of the world. I don’t know if chickens are able to learn to respond to their names, like cats or dogs. I hope not. When I open the door of their run they don’t come to me wagging their tails, they don’t rub themselves against my legs; rather, they eye me cautiously and keep the distance. My first impression of them is that they are very different from any animal species I have experience of. And that is a good thing because it means I have a lot to learn. I will have to find a way of relating to them in their own terms. I will have to learn how to earn their trust and their affection. I will have to try to get inside their heads to find out what they like and what they don’t in order to make their lives the best possible. Can anyone possibly think of a more fascinating adventure? Las gallinas tienen nombre, por supuesto. Es una de las primeras cosas que todos hacemos cuando un animal entra en nuestra vida. Se podría decir que al nombrarlos, los hacemos nuestros, los convertimos en objetos de nuestra propiedad. A través de un nombre proyectamos sobre ellos ideas y expectativas, enfatizamos ciertas características. Siendo un poco menos cínico, diría que al nombrarlos les damos individualidad, un recipiente que ellos llenarán con su personalidad, con las anécdotas y la historia de sus vidas. Pero lo que realmente me parece importante es que al otorgarles un nombre, tendemos un puente hacía esos seres todavía desconocidos, como un modo (torpe y muy humano) de sentar los cimientos de esa relación que nos va a unir a ellos. Y ese puente es un puente de rudimentario afecto. Nuestra dependencia de las palabras es tal que parece que las necesitamos hasta para querer. Quizás por eso inventamos nombres secretos para nuestros amantes, en un intento de crear una intimidad exclusiva. Las gallinas se llaman Betty, Elsa y Quetzalcóatl. Para las gallinas sus nombres no significan nada. No necesitan palabras para relacionarse con los otros, sean de la especie que sean. Las gallinas tienen otros modos de darle sentido al mundo. No sé si las gallinas son capaces de aprender a responder a su nombre, como los gatos o los perros. Espero que no. Cuando les abro la puerta del corral no se acercan a mí moviendo el rabo ni se frotan contra mi pierna, sino que se mantienen cautelosas y desconfiadas. Mi primera impresión es que son muy distintas a todos los animales de los que tengo experiencia. Y eso es bueno porque quiere decir que tengo mucho que aprender. Habré de buscar la forma de relacionarme con ellas en sus términos. Tendré que aprender a ganarme su confianza y su afecto. Deberé intentar meterme en su cabeza para averiguar qué les gusta y qué no para hacer que su vida sea lo mejor posible ¿Hay alguien que se pueda imaginar una empresa más fascinante? Probablemente debería empezar este diario relatando todo lo que sucedió antes de la llegada de las gallinas. Como por ejemplo, las horas que pasé en Internet en busca del gallinero perfecto. O el disgusto que me llevé, y que casi dio al traste con nuestros planes, cuando una vecina me dijo que las escrituras del piso no me permiten tener gallinas en el jardín. Quizás debería mencionar los libros sobre avicultura que leí con una mezcla de entusiasmo y ansiedad, intentando memorizar todo lo importante. Pero estos preámbulos resultarían aburridos porque la verdad es que las gallinas ya están aquí, escarbando en el jardín, y lo demás no importa. Mi jefa, que es una experta cuidadora de gallinas, me llevó la semana pasada a una granja de East Lothian. Llevamos un par de transportines para gatos. Cuando de niño iba con mi madre a comprar gallinas, la granjera usaba cajas de cartón en las que tajaba agujeros triangulares con una navaja para que las gallinas pudieran respirar. Luego cerraba la caja y ataba una cuerda sobre las tapas. Recuerdo la emoción con que yo llevaba la caja agujereada en los brazos, mientras en su interior las gallinas movían los pies intentando mantener el equilibrio. Para mí aquello no se trataba de una compra sino de llevar a casa animales para hacernos cargo de ellos. Y, así, caminaba hacia el coche abrazado a la caja con el pecho henchido de responsabilidad y teniendo cuidado de no tropezar. El granjero de East Lothian había apartado unas cuantas gallinas en un gallinero para que pudiera elegir cuáles me quería llevar. Aunque siempre estoy encantado de llevarme animales a casa, detesto tener que elegir. Hay algo inicuo en ese acto de elección. Por suerte las gallinas no actuaron como los perros de la protectora de animales, que ladran en el frente de la jaula, como diciendo “llévame contigo, llévame por favor”. Las gallinas, de decir algo habrían dicho “aléjate de mí, por favor”. Además estaba el hecho de que así, de buenas a primeras, todas las gallinas parecían iguales. La decisión fue fácil y justa. Había tres razas distintas: me lleve una de cada. Cuando llegamos a casa ya había anochecido. Lo único que podía hacer era meter las gallinas en el gallinero (que es como una caseta de perro, con perchas y nidales en un lateral) y dejarlas que se pusieran cómodas. Fuimos a verlas un par de horas más tarde. Siguiendo su instinto de supervivencia, se habían acurrucado entre sí sobre la percha. Sus ojos brillaban recriminatorios a la luz de la linterna. Querían que las dejáramos en paz. Fue difícil esa primera noche. La alegría por su llegada se tiñó con el desasosiego de imaginarlas encerradas en la oscuridad extraña de su nuevo hogar. I should probably start this diary with everything that happened before the arrival of the hens. I should mention the hours of research looking for the perfect chicken coop. Or the commotion of being confronted by the news, brought by a malicious neighbour, that according to my deeds I couldn’t keep chickens in my garden. I should talk about the books on hen keeping that I read with a mixture of excitement and anxiety, trying to memorise all the important bits. But that would just be extremely boring because the truth is that the hens are now here, scratching away in the back garden, and that’s all that matters. My boss, who is an experienced hen keeper, drove me last week to a farm in East Lothian. As there is no such thing as a hen carrier we took a couple of cat carriers to put the hens in. Back in the days when I was a child and I used to go with my mum to buy hens, the farmer had cardboard boxes and he sliced triangular holes in them with a rusty cutter so that the chickens could breathe. Then he put around the box a piece of string and he tied it at the top. I still remember the thrill of walking back to the car with a perforated cardboard box in my arms while the hens shuffled their feet inside, trying to keep the balance. I never felt we were purchasing them but rather that we were taking them under our care. As I was carrying the box I was careful not to trip and walked solemnly, puffed up with a sense of responsibility. The farmer in East Lothian had kept a few hens in a shed so that I could take my pick. Now, I love taking animals home with me but I really don’t like picking. Fortunately, the chickens were not like the dogs at the RSPCA. They didn’t seem to be saying ‘choose me, please choose me’, but rather ‘stay away from me”. The other thing is that all of them looked pretty much the same. There were three different breeds, so it was easy: I got one of each. It was dark when we got home. There was not much else to do other than putting the hens in the coop and letting them settle in. We went to check on them a couple of hours later. They were huddled together on the perches, following their natural instinct to keep safe. Their eyes shone suspicious in the light of the torch. They just wanted to be left alone. It was hard that first night. Somehow it pained me to think about the hens locked in the darkness of their strange new home.